VVOL is not a feature that vSphere delivers, like vMotion, but an API that storage vendors must implement. VASA provider, or a Virtual Volume Storage Provider (let’s call it the VP) is a software component that acts as a storage Awareness Service for vSphere and mediates out-of-band communication between vCenter and a storage system. The VP can take different forms; some array vendors have it embedded in the storage controller while others run it in an appliance. An administrator needs to add details of the VP to vCenter server. This is usually something as simple as providing a URL to the VP, along with some credentials. This information should come from the array vendor documentation. Virtual Volumes (VVols) are stored natively inside a storage system that is connected through block or file protocols. They are exported as objects by a compliant storage system and are managed entirely by hardware on the storage array. Virtual Volumes are encapsulations of virtual machine files, virtual disks, and their derivatives. Today LUN-Datastore vSphere environments, a datastore serves two distinct purposes – It serves as the access point for ESXi to send I/O to, and it also serves as storage container to store many virtual machine files (e.g. VMDKs). If we separate out the concept of the access point from the storage aspect, we can run with a fewer number of access points, each of which could refer to a number of storage entities. This is the purpose of the Protocol Endpoint. We can very many virtual volumes with just a few access points. The first thing to point out is that a storage container is not a LUN. It is a logical storage construct for the grouping of virtual volumes and is setup on the storage array by the storage administrator. In some respects, it can be thought of as a pool of storage on the array. The capacity of the container is based on physical storage capacity and there must be a minimum of at least one storage container per array. The maximum number of storage containers depends on the array. Multiple different storage containers can be used to logically partition or isolate VMs with diverse storage needs and requirements. A single storage container can be simultaneously accessed via multiple Protocol Endpoints. 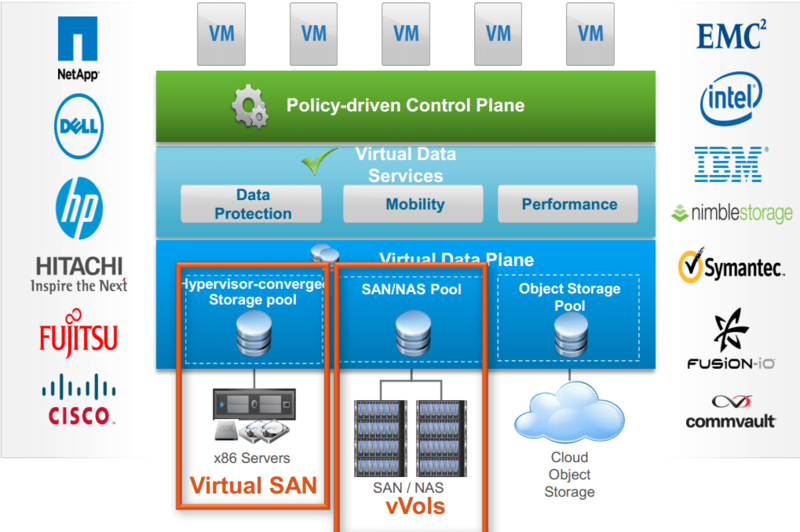 Those of you who are familiar with VSAN will already be familiar with virtual volumes in some respects. When we talk about virtual volumes or VVols, what we are basically talking about is the encapsulation of virtual machine files on hardware and exported as objects. Virtual Volumes are created when you perform Virtual Machine operation such as “Create a Virtual Machine”, “Power on a Virtual Machine” or “Clone or Snapshot a VM”. vCenter associates one or more Virtual Volumes to a Virtual Machine. A Virtual Machine, when deployed to a VVol datastore, can be though of as being comprised of a number of Virtual Volumes.